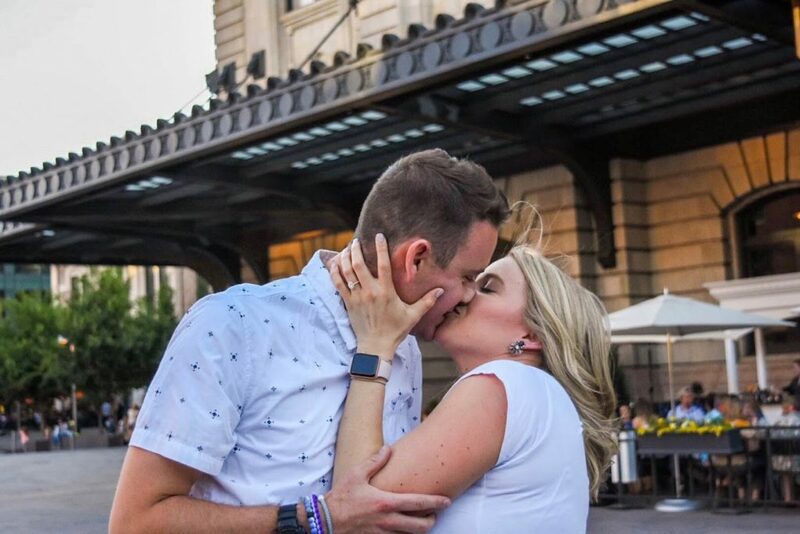 Ian and Alana grew up just one mile apart, but they’re much closer now thanks to some good decisions and a timeless ring. Ian and I actually grew up a mile apart. We went to all of our schooling together, but we didn’t become friends until college. We officially started dating in October 2016, but we actually dated twice before that. In the summer of 2016, I had just moved home from Seattle and Ian found himself in a point of transition. We hadn’t spoken in three years, but we quickly found ourselves in the same group of friends and attending many of the same social functions. A few months later, Ian invited me to attend a CU football game with him. He picked me up at 8 am, and we didn’t separate until the following morning. We spent the whole day giving each other “goo goo eyes” and not so subtly flirting. After the game we texted none stop for an entire week, until finally, I so bravely asked Ian when he was going to take me on a date. Finally, timing worked out for us. From our first “official” date, we were inseparable and moved quite quickly. We moved in together after 6 months, traveled around Europe, bought a puppy and got engaged all in a year and half. I knew immediately that things were going to be different with Ian. I fell in love with Ian during a blizzard, while we were hunkered down watching movies all day and snuggling. I knew right then, that I could see myself being with him forever. We both agree, life is easy together. We planned to go to the Rockies game with two of our best friends on a Friday night in June. I was just returning home from a business trip and was rushing home from the airport to meet up with Ian and our friends. 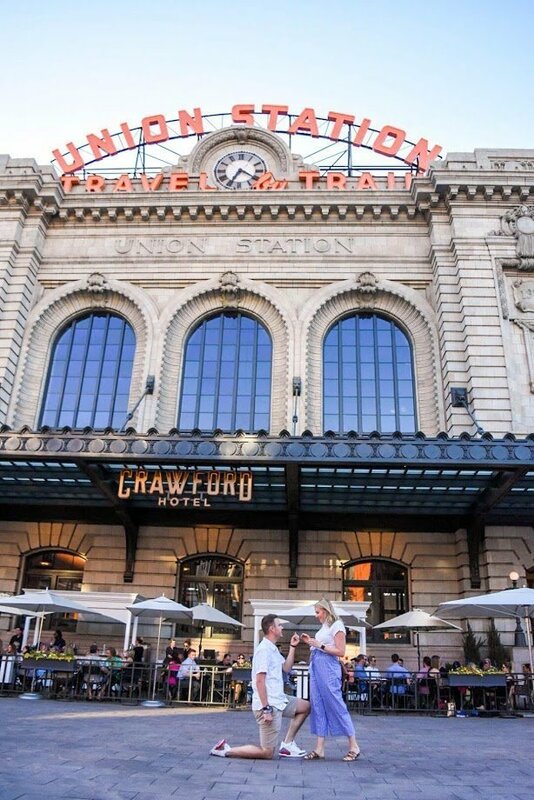 I got to our house and Ian told me to meet them at The Terminal Bar in Union Station for a drink before we went into the game. I arrived and was very excited to see Ian after a few days away. We chatted and had a drink before it was time to leave. Ian grabbed my hand and said “I love you to the moon and back” as he went down to one knee. He asked me to marry him and the crowd behind us went wild, clapping and hollering. Ian got my friend’s younger sister to post up at Union Station and take photos. After the excitement I asked if we were still going to the Rockies game and Ian said of course. 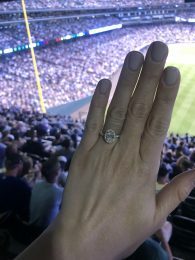 We walked to the Rockies game as I was giddy and could not stop staring at my beautiful ring. We went up the elevator and Ian, who works for the Rockies, led us to the suite level as I followed blindly behind. He opened the door and inside was a suite filled with our parents and 25 of our closest friends. We spent the first evening engaged with our closest friends and family celebrating our future. It was a wonderful evening that Ian carefully planned out for months. I really had no idea what kind of engagement ring I wanted. I knew I wanted a gold band, but other than that I was overwhelmed with all the options, so I’m glad I wasn’t the one picking out the ring. Little did I know that my dream ring is an oval diamond, with a halo and a gold band, but Ian knew. My ring is absolutely perfect and I love it more each day that it sits on my finger. The night we got engaged, I actually woke up in the middle of the night, turned on my phone flash light and admired it for a few minutes in the dark. It’s perfect, delicate and feminine, exactly how I always dreamed my ring would be. Alana and I grew up in the same home town so we had always known each other throughout high school and college. We had some of the same mutual friends so during social gatherings we were typically together. We hung out a little bit my sophomore year of college and then dated a little more seriously the summer after my senior year. She began her senior year of college as I had already graduated and the timing just didn’t work. Alana then moved to Seattle for 3 years after college. She moved back May of 2016. We were then in the same wedding together in July and walked down the aisle together. A couple months passed and the timing finally worked and began to hang out again in early October of 2016 and had our first official date a couple weeks later. The rest is history! Alana and I had always liked each other.. As she mentioned we had dated a couple times before. I am a year older so the timing never lined up. I had graduated college and she still had a year left and it just wasn’t going to work the way we had hoped. She then moved to Seattle for 3 years. I had recently gotten out of a relationship when Alana and I hung out again for the first time when she moved home to Colorado. It was a group setting but we spent the whole day and night together. It finally felt like we had the timing down. I can’t really say the exact moment I knew she was the one but I knew that she had suddenly come back into my life and I didn’t want to lose her again.. Everything was easy. I remember one day just realizing I have never been happier and this is what I want my life to be.. And my life wouldn’t be this way unless she was a part of it so at that point I knew I never wanted to let her go. I had been planning the proposal for a while. My whole plan was to involve a Rockies game but needed to settle on a date. The only date that worked for everyone was Friday, June 1st. That happened to be the day she was traveling back to Colorado from a business trip. With that being said, I had to make sure she knew the tickets I had were special and we couldn’t just not go if she was too tired or wasn’t feeling up for it. I was able to convince her and the plan was set in motion. Since I work for the Rockies I was able to purchase a private suite at a discount that could hold 34 people. I was able to fit all of our friends and family in there. 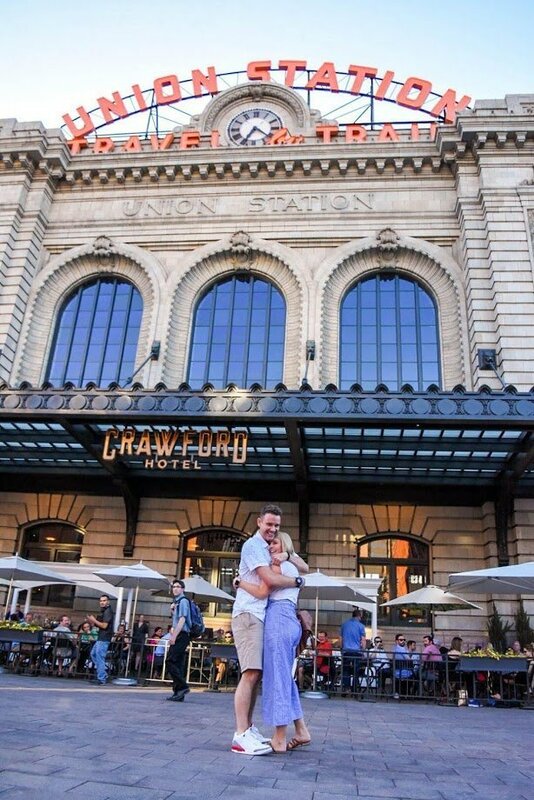 The plan was for them to go to the game and hang out until we arrived post proposal. During the day Alana’s friend dropped off balloons, pictures, decorations, etc. that I put in the suite. After I was off work I met our 2 friends at the Terminal Bar at Union Station to wait for Alana. Meanwhile, friends and family filtered into the suite to decorate and hang out. Once I knew Alana had landed safely and on time I knew we were in good shape. I had a couple drinks with our friends while we waited. In addition, one of Alana’s friends sisters is a amateur photographer so I had her disguised waiting outside. Alana showed up and we had a drink and hung out and then decided it was a good time to go to the game. The day before I had done a walk through to determine where I should drop to 1 knee.. I aimed for that spot and when we got there our friends had fallen back behind us to watch. I asked her, “Have I told you how much I love you today?” (This is a question I jokingly ask her all the time). She replied, “No you haven’t!” And I dropped to a knee and said, “I love you to the moon and back.. forever. Alana Margaret Macy.. Will you marry me?” She started to cry and the photographer snapped a bunch of pics as our friends came up to us. Alana asked if we were still going to the game and I said, “Of course!” She thought we were going to an area we had gone before with special tickets.. So a 2nd surprise was coming. We got into the stadium and went up the elevator and once we got outside the suite door she saw the suite sign that said, “Congratulations Ian & Alana!” and as I opened the door everyone was in there to surprise her. She had no idea and it was was a massive success. All the planning had worked out. I did not know the first thing about diamonds, rings, settings, etc. I did some googling to get an idea but still I didn’t even know what I was looking for. The only detail Alana had told me was she wanted a gold band. I had planned 2 visits for when she was out of town for a weekend. I solicited the help of her best friend Tara, who is my best friend’s wife to a take a Saturday to go with me. We started with Brilliant Earth just because that was one of the places Alana has told me about via Instagram. We went there and looked at a bunch of different shapes, sizes, cuts, of rings. I settled on a design I liked. I left and told Tara unless I am “Wowed” by The Diamond Reserve I will probably go with them. Tara had been the one who told me to make an appointment with Kaeleigh because her coworker’s fiancé went there and had a great experience. Well long story short I was completely wowed by my experience and the education Kaeleigh gave about diamonds, rings, pricing, etc. Tara had a glass of Rose as I had a beer while we finalized the details of the ring. The coolest part was that I was actually able to see and hold the exact diamond that is on Alana’s ring. The ring she has is completely custom and I will always know she is wearing an original ring. It’s beautiful, clear, so sparkly, and absolutely perfect. And of course, she has a gold band. When I finally picked it up and I had to hide it.. When I knew I was alone I would take it out from time to time so I could look and admire it. She loves it.. I love it.. I can’t wait for it go fit right alongside a wedding band.